REUTERS/Toru HanaiJapan’s Prime Minister Shinzo Abe claps his hands during the Lower House plenary session of the parliament in Tokyo, November 26, 2013. 2. Japanese Prime Minister Shinzo Abe has dissolved the lower house of parliament, which paves the way for a general election expected next month. 3. US President Barack Obama unveiled his executive plans to shield 4 million undocumented immigrants from deportation during a televised speech from the White House Thursday night. Ferguson Police Officer Darren Wilson, who shot and killed an unarmed black teenager in August, is reportedly in talks to resign, the same day that a grand jury is meeting to possibly decide on an indictment against him. 5. The spread of Ebola in Liberia has slowed due to increased efforts by the international and local communities, the CDC said. 6. US Secretary of State John Kerry is pushing to reach an agreement in the Iran nuclear talks being held in Vienna, ruling out the discussion of another extension. 7. Tens of thousands marched in Mexico City to demand the return of 43 missing students who have not been seen since a clash with police on Sept. 26. 8. A nearly 60-page internal Uber presentation reveals that the 4-year-old mobile ride service could soon generate $US10 billion of revenue per year. 9. 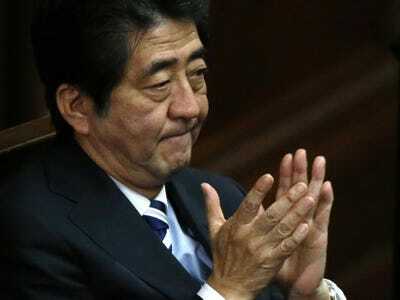 Support for Japanese Prime Minister Shinzo Abe is at its lowest since he took office in December 2012, a survey showed. 10. Mike Nichols, who won and Oscar for directing “The Graduate” and was also nominated for such films as “Working Girl” and “Remains of the Day,” died on Wednesday at the age of 83. Britain’s first “Bio-Bus” powered entirely by human and food waste is now in service between Bristol and Bath.